Valves are rhombic with straight margins and rounded apices. Striae are radiate throughout valve. The central area is asymmetrically rounded and axial area is narrow and straight. Striae at the center valve margin are short, and not interrupted. The raphe is positioned within two longitudinal ribs on the external valve face. The ribs terminate at the edge of the central area and the apices. Raphe is straight and filiform. The proximal fissures are undifferentiated and the distal fissures are T-shaped. 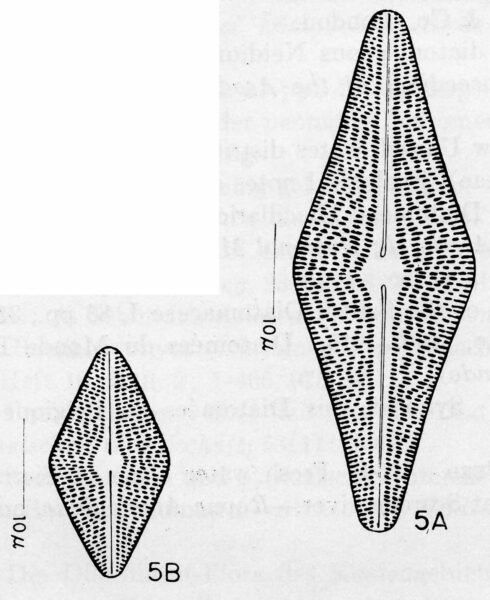 Areolae are variable in shape, mostly elongate with respect to the transapical axis. The orientation and irregular size of the areolae creates a series of wavy hyaline areas. Small papillae (visible in SEM) may be positioned on rows between the striae. A thickened rib is present along the valve margin and apex, separating the valve face from the mantle. Striae on the mantle are uniseriate and aligned with striae on the valve face. In SEM, the internal proximal raphe fissures terminate at a small helictoglossa. Areolae are covered internally with flat, well-defined hymenes. Externally, a well-defined, thick rib defines the valve face / mantle interface. The mantle contains a single row of elongated pores, each of which is covered internally by a hymen. Little is known about the ecology of B. hannae, since it is rarely reported. The lmited records are from acidic, humic strained waters. 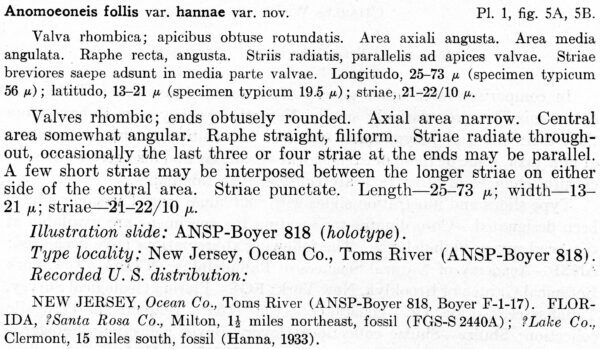 Original text and images reproduced with permission by Academy of Natural Sciences of Philadelphia. Shayler, H.A. and Siver, P.A. (2004) Biodiversity of the genus Brachysira in the Ocala National Forest, Florida, U.S.A. 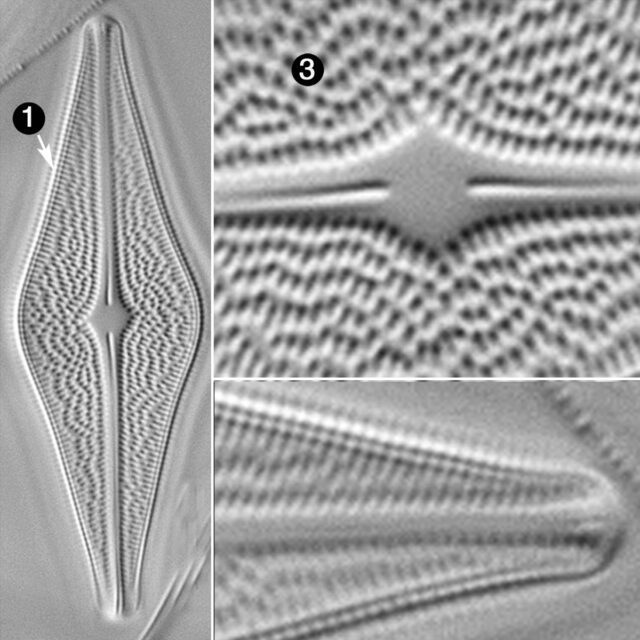 Proceedings of the Seventeenth International Diatom. Symposium Ottawa, Canada, 25th – 31st August 2002 (M. Poulin, ed. ), Biopress limited, Bristol. p. 309-333. Valves are rhombic with straight margins. The valve length is two to three times the valve width. Within each stria, the orientation and irregular size of the areolae creates a wavy appearance of the striae. Striae at the center valve margin are short, and not interrupted.